So over the past weekend, I didn’t try anything new or different from the items I normally review. Of course not. I had Chipotle. Not once but twice. I just love it that much. Because of that, I have instead decided to review a new snack that I have recently found. Sunflower Seeds. Dry roasted, unshelled Sunflower Seeds. I have purchased these for many years for Taylor but have never had any reason or desire to try them. On Monday night, I got home from work and wanted a quick snack before I went running. For whatever reason, I went for a handful of seeds and I am glad that I did. 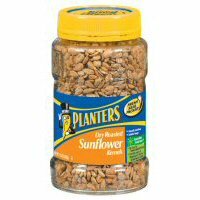 These sunflower seeds come in a glass jar, are made by Planters and a serving is ¼ cup. A ¼ cup of unshelled sunflower seeds is quite a lot. On all occasions that I have had these since trying them, I have maybe only had an 1/8 of a serving at each time. And even this amount, provides quite a lot of seeds. I enjoy eating the seeds one at a time to really enjoy the flavor and make the snack last as long as possible. Sunflower seeds in the shells are one of those things that always irritated me. They would take entirely way too long to get of the shells and the end product was just not worth it for me. Now that I have discovered these roasted seeds, my eyes have been opened. The roasted flavor in these seeds can not only be smelt but can be tasted as soon as you begin to eat them. The nuttiness of the seeds really comes through while eating these as well. Each seed is crunchy but not to the point of being overcooked and burnt. The crunchiness and nutty flavor is what really attracts me to the seeds. Unlike other nuts, I don’t feel like you get an oily taste when you eat the seeds. I also enjoy the fact that their taste is not overbearing. The hardest thing about these seeds is that they are so small. It is difficult to find a perfect way to eat and enjoy these. I have found that taking a few from my Ziploc bag, placing them in my hand, and eating them one at a time works the best for me. Crunchy, tasty, nutty, roasted, mmm. Overall Rating: 7/10. Sunflower Seeds are a cheap snack and one that I have now found that I enjoy. I am curious to see whether or not I would like unroasted Sunflower Seeds. The roasting of these seeds, I’m sure, adds additional flavor to them. A great snack that makes me feel like I am eating way more than I actually am – which is always good. I’m not sure how likely I will be to try other Sunflower Seed Items (like Chocolate covered Sunflower Seeds) but, I am certainly glad that I tried these.